Home tangerine citrus, an evergreen plant that can become a real decoration for your home. However, the plant brought joy, you must know all the nuances of the care of Mandarin and rules for its transplant. 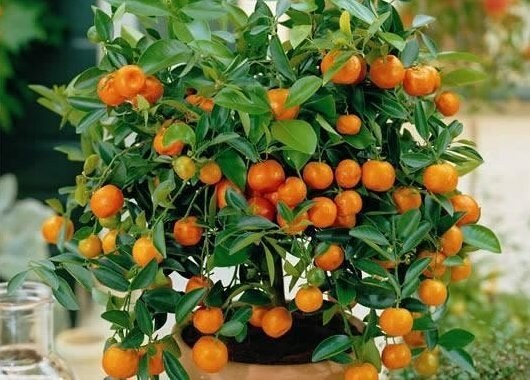 With proper care at home tangerine tree can grow up to one meter in height, blossom and even bear fruit. But in order to obtain such results, it is necessary to care for plant that requires annual transplant at a young age. To put the Mandarin in the first place, care must be taken that the soil was suitable for citrus plants. In order to obtain the correct ground, take half of a pot of sod land, and the other half make up from equal proportions of leaf, humus and sand. Mix the soil. Prepare a new pot for home of Mandarin. It needs to be more than the previous several centimeters in diameter, but it is not necessary to transplant small Mandarin in a large pot, as its root system can rot. On the bottom of the new pot be sure to put drainage, it is necessary to ensure that water does not stagnate in the pot. The quality of drainage you can use the stones of small size or expanded clay. When all transplant Mandarin is prepared, pour room Mandarin with warm water, the water should be 15-20oC. Give the plant time to it were filled with water, and after a few minutes gently remove the old pot, be careful to not damage the roots of the Mandarin. In any case, not Strachowice with the roots of the plant an old earth, or the Mandarin may not take root in a new place. Take the new pot, fill it with prepared soil and vertically install the plant, then fill it the rest of the land. Pour the Mandarin with warm water and leave. In this transplant the tangerine tree is finished. To better plant took root in a new place, be sure to follow the climate of the room. The mandarins do not love the heat and extreme temperatures, but the humidity they require is quite high. Homemade mandarins under the age of four years should be transplanted every year in the future, the plant requires periodic transplant every 3-4 years. In any case, do not attempt to transplant the tangerine tree in the period of its flowering, it is best to transplant the plant in early spring, when it begins to Wake up after hibernation. 2-3 days before transplanting stop feeding the plants, and after you've transplanted Mandarin, do not use fertilizer within two weeks.